Sundew Propagation: The Summer Batch |Sundews Etc. Follow all the progress of the Summer Batch here. A week or two ago I mentioned that I had finally set up a new propagation area, something I had been threatening for a long time. 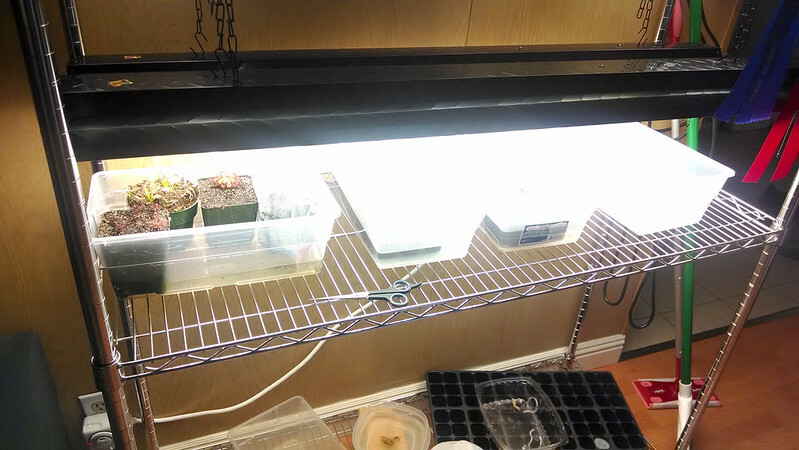 It basically consists of my regular lighting set (2 fixtures, 3 bulbs each, four-foot T8s), a number of 6 qt (5.7 liter) Sterilite containers, and some 6-cell seed starting trays. 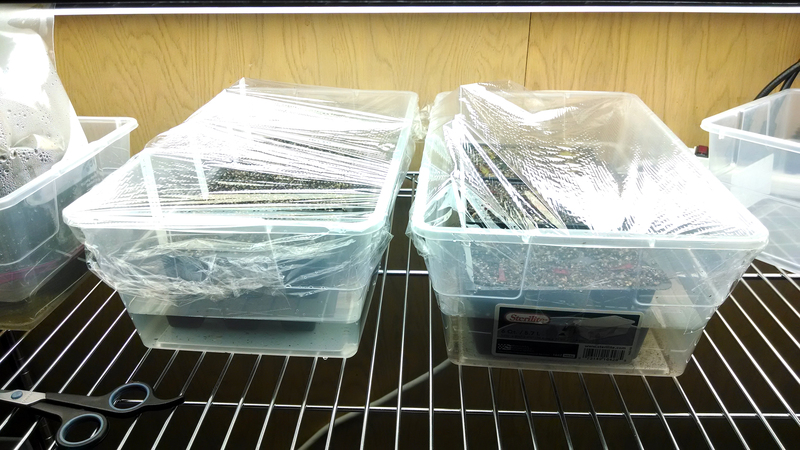 I can fit three 6-cell trays into one container, and then cover them with plastic for humidity. It's a pretty space-efficient setup. Propagation area operating at less than half capacity. It's also impossible to photograph because the the lights, but we knew that already. Yesterday I decided to finally start using it for propagation. I started 8 species propagating, 4 from seed and 4 from cuttings. To start off with, I mixed a special batch of media. 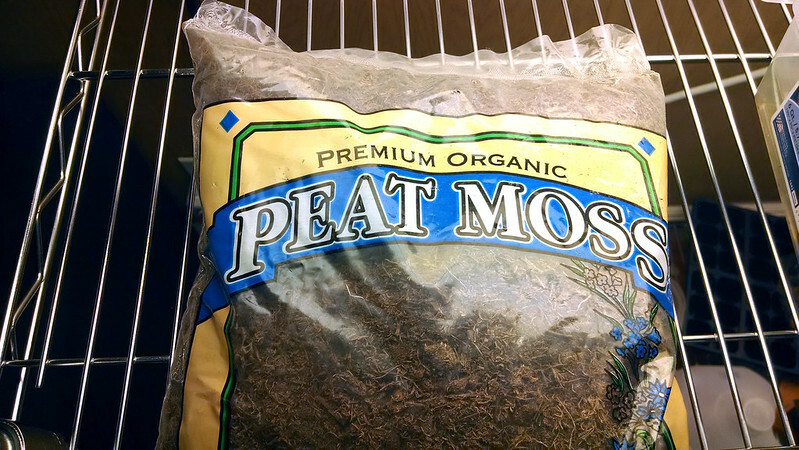 I wish this peat wasn't so expensive – it's much nicer to work with than the bulk stuff. This is a smallish bag of expensive Uni-Gro peat moss I bought back when I was first starting out (before I got my big bale). It's coarser and cleaner than my bulk stuff, so I decided to use it for seed/cutting starts. I rinsed/squeezed it once, and then re-wet it with boiling water, which will hopefully also keep down moss/algae/mold for a while. Mixed with around equal parts washed sand, and the filled six of the 6-cell trays. The bottom is lined with long-fiber sphagnum to hold in the media and for wicking action. Seed starter trays ready and full of promise. My first container I started with seeds I've collected. 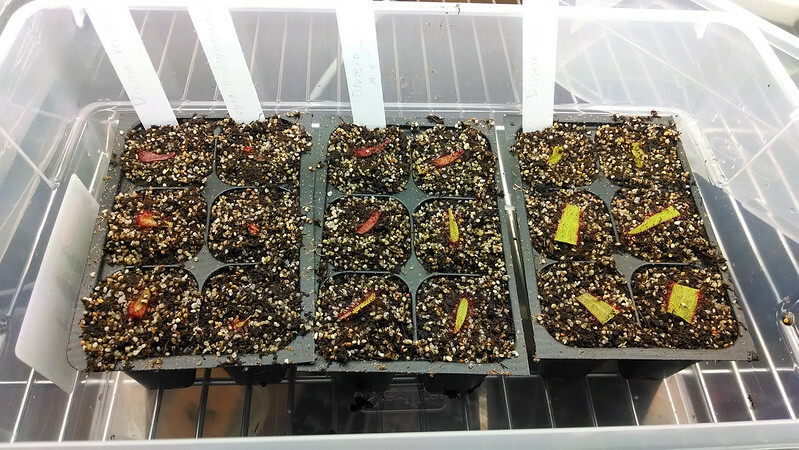 Six cells each were for Drosera intermedia 'Cuba' and Drosera burmannii Humpty Doo, while Drosera tokaiensis and Drosera capillaris Alabama got 3 each. 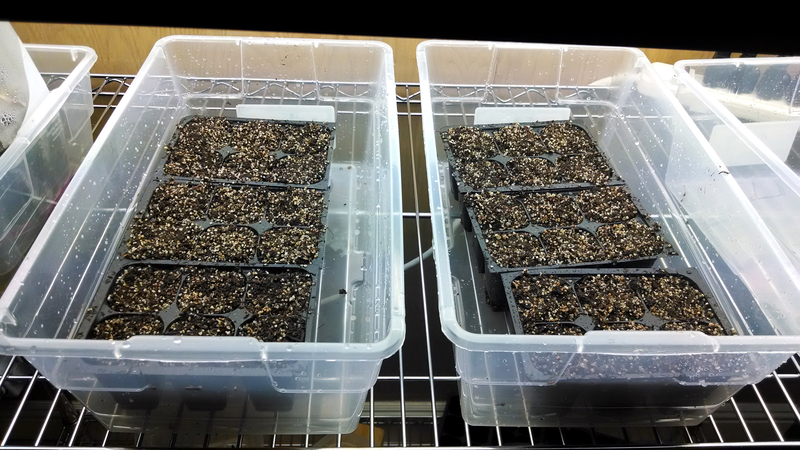 I want to make sure the seeds from my D. tokaiensis are viable before I distribute them, and I'm going to see if D. capillaris would prefer cold stratification for good germination. I did about 5 seeds per cell except for the Drosera burmannii, where the seeds are just too small to sow that carefully. The second container got cuttings. Drosera adelae and Drosera anglica CA x HI each got 6 cells, while Drosera venusta and Drosera madagascariensis Masoala, Madagascar each got 3. My D. anglica wound up with a bit of a haircut, but hopefully I'll have lots more plants to share soon. From the left: D. venusta, D. magagascariensis, D. anglica, D. adelae. This was sticky work! I then wrapped everything in plastic wrap to keep up humidity, taped 'em closed, and stuck 'em under my lights. I'm going to keep note of their progress here on the blog. Ideally I'll have some that are ready to share by the Autumn BACPS meeting, but at the latest I know I'll have some ready by winter. I'll be updating regularly on these starts as soon as things start happening. Stay tuned!